I was excited to see that Pat Helland has published another thought provoking paper: Immutability Changes Everything. If video is more your style, Pat gave a wonderful talk on the same subject at RICON2012 (video, slides). It's fun to see how Pat's thinking is evolving over time as he's worked at Tandem Computers (TransactionMonitoring Facility), Amazon, Microsoft (Microsoft Transaction Server and SQL Service Broker), and now Salesforce. You might have enjoyed some of Pat's other visionary papers: Life beyond Distributed Transactions: an Apostate’s Opinion, The end of an architectural era: (it's time for a complete rewrite), and Idempotence Is Not a Medical Condition. This new paper is a high level overview of why immutability, the idea that destructive updates are not allowed, is a huge architectural win and because of cheaper disk, RAM, and compute, it's now financially feasible to keep all the things. The key insight is that without data updates, coordination in a distributed system becomes a much simpler problem to solve. RedHat is linking microservices and containers with immutability. Immutability is an architectural concept that's been gaining steam on several fronts. Facebook is using a declarative immutable programming model in both the model and the view. We are seeing the idea of immutable infrastructure rise in DevOps. Aeron is a new messaging system that uses a persistent log to good advantage. 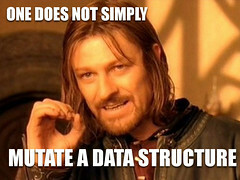 The Lambda Architecture makes use of immutability. Datomic is a database data that treats data as a time-ordered series of immutable objects. If that's of interest, then you'll like the paper. It wasn’t that long ago that computation was expensive, disk storage was expensive, DRAM was expensive, but coordination with latches was cheap. Now, all these have changed using cheap computation (with many-core), cheap commodity disks, and cheap DRAM and SSD, while coordination with latches gets harder because latch latency loses lots of instruction opportunities. We can now afford to keep immutable copies of lots of data, and one payoff is reduced coordination challenges. - "Preemptive Immutability" aka copying all data even if they are subject to serial, single threaded processing imposes a massive performance hit. Selling "Copy all your data in order scale" is a hoax. I have not come over a real world benchmark/application where this actually lead to anything but consuming more CPU to achieve mediocre if not ridiculous results. - Machines have gotten faster + memory bigger, but requirements also rose: more users, more data, more realtime. Investing hardware gains into immutability will let you solve yesterdays requirements with todays hardware. Not competitive. Yes, latches are expensive, so is moving data. Immutabie systems have to move *a lot* of data, so this becomes the bottleneck (unfortunately cost of moving data increases with number of cores/processing units). Practice tells one has to carefully reduce both factors to get best value out of many core hardware: reduce/avoid locks and reduce/avoid movement of data. First scale up, *then* scale out. @Ruediger Moeller: SSD disks do the same thing. They write almost immutable data. It is not a "misconception". Some data centers prefer Log Structured Merge Tree databases (LSM tree) also, in order to improve the write performance on SSD, even that more read operations are necessary. Old data need not be moved and merged until a high percent of rows has been updated or deleted. The merge operation can run incrementally by steps of a few megabytes, with pauses and without filling the cache. The lowest merge levels can run preferably in periods of moderate traffic. I can imagine that it is runnig better than the internal SSD garbage collector after many smaller random write requests. Pat Helland said it expressively and so simplified to inspire to start thinking other way. All people know that nothing is usually forever. Not all merge levels are probably the same. Users can profit from this architecture: The last merge operation can be combined inexpensively with a full backup. Users can enable a trash bin, full history of important fields etc. All these "decorations" can be postponed a little to the time of normal load if the recent information can be found in a good LSM tree.